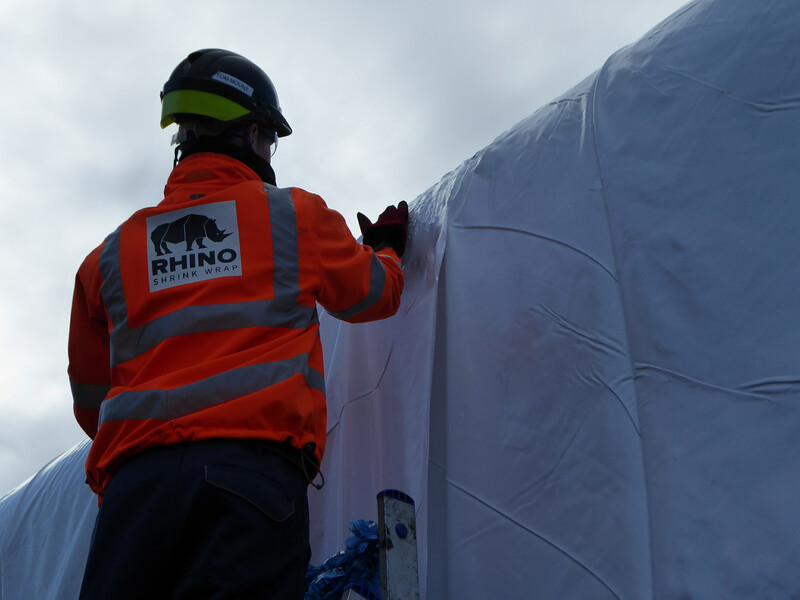 This case study will give you some insights into how the team at Rhino Shrink Wrap specify and install large industrial covers, including a step by step description of the method by which we installed a 1224 square metre (13,175 square feet) shrink wrap cover to encapsulate and protect a large stack of line pipe in December 2015. 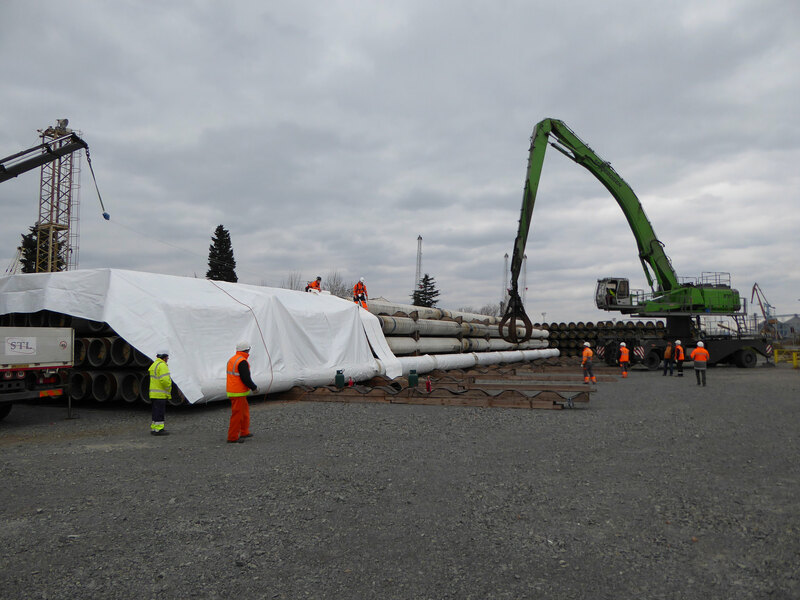 In November 2015, we were contacted by South Stream Transport BV who were looking to find the best way of covering stacks of subsea line pipe, that were being stored ashore awaiting installation. South Stream Transport are an offshore pipeline company based in The Netherlands. Working with Gazprom, South Stream are building ‘TurkStream’, a pipeline under the Black Sea that will connect gas reserves in Russia to the Turkish gas distribution network and so provide energy supplies for Turkey and South-East Europe. Although, line pipe is designed to be a rugged product once installed on the sea bed, engineers from South Stream were concerned that pipe coating could be damaged by long term exposure to UV light during storage ashore. Some kind of covering was required but what type? 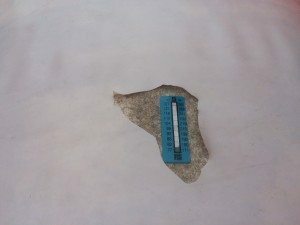 The customer had of course considered using tarpaulins and had even carried out some trials of large tarps but these had not been 100% successful. Tarpaulins of course can be very useful but for this application they were proving bulky and heavy to lift which made them hard to install and some had been blown off by the wind. Robust – A shrink wrap cover will be shrunk ‘as tight as a drum skin’ around the line pipe stacks. This means it is much more robust than traditional tarpaulins which can be difficult to fit tightly. This means it will not flap and ‘self destruct’, even in high winds. Heat sealed joints – A shrink wrap covering is easily joined by heat welding two sections of cover together. This process creates a bonded and weather proof joint as strong as the original shrink wrap material and means that there is no limit to the size of area that can be completely encapsulated. Easy to repair – Because of the heat welding / sealing process, a shrink wrap cover is very easy to repair. Simply take a new section of shrink wrap and heat weld over the damaged area. 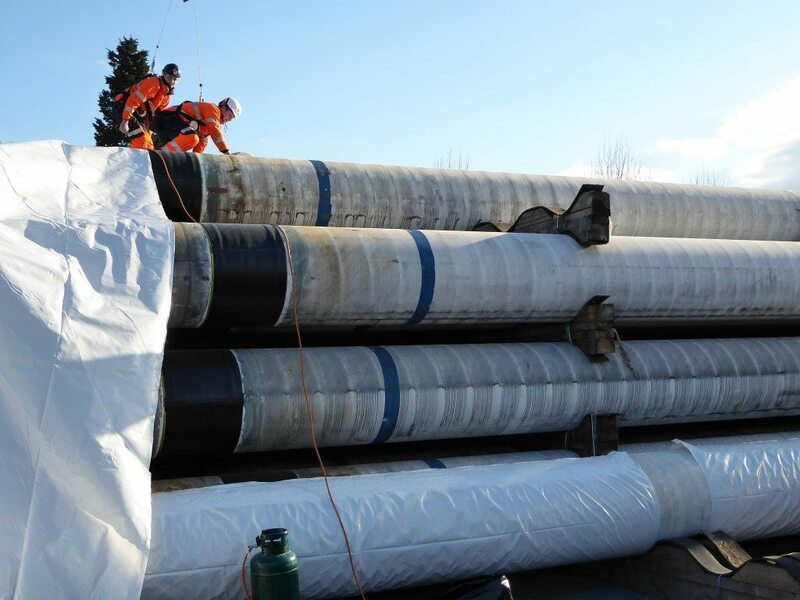 Versatile – Because a shrink wrap cover is cut and heat welded by the installation team at the location it is required, there is no need to order specific sizes of cover in advance for different sized stacks and there is no need to ensure that a specific cover is used on a specific pipe stack. If the line pipe stack layout changes, this can be taken care of easily within the standard product. 100% Recyclable – Traditional tarpaulins can be difficult to recycle because of their composition, which makes the separation of materials problematic. However, a shrink wrap cover is very easy to remove and is completely recyclable. Because the shrink wrap is manufactured from 100% virgin resins, it is valued by re-processing companies. Typical applications for recycled industrial grade shrink wrap film are HDPE piping and agricultural films such as silage or bale wrap. How will the industrial covers be secured? When we look at a new application for a shrink wrap covering we need to consider how the sheeting will be held down or secured to whatever it is covering. When the cover is properly locked down into position, the heat shrink process will create a taught and ‘drum tight’ covering. For scaffolding encapsulation, the shrink wrap sheeting is simply overlapped around a horizontal tube or ‘ledger’ and heat welded back on to itself. For large industrial covers, such as these huge modules we wrapped for Interserve it may be possible to bring the shrink wrap completely underneath the object so that it is completely encapsulated. The first line pipe stack to cover was 48m (157′) long x 15m (49′) wide x 4m (13′) high – a total area of around 1224 square metres or 13,175 square feet. This was too large to lift and sheeting could not be slid underneath because the pipes were sitting on long wooden ‘bearers’. 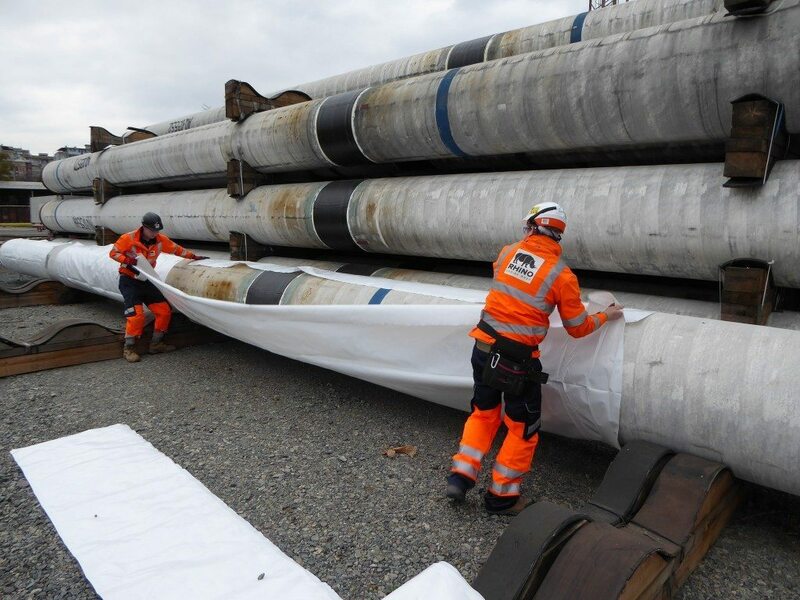 We considered running a band of strapping down each 48m side of the line pipe stack which we could overlap the shrink wrap around and heat weld back on to itself but at this length it would have been difficult to tension the strapping sufficiently to stop the cover ‘riding up’ around the pipe when the cover was heat shrunk. The solution was to encapsulate the lowest pipe running along the bottom edge of each stack with band of shrink wrap. This would mean that the top cover could be unfolded along the roof and down the side of each stack and could be then simply be heat welded to the lowest shrink wrapped pipe to lock it into position. The additional benefit of this solution is that it is completely ‘self contained’, i.e. 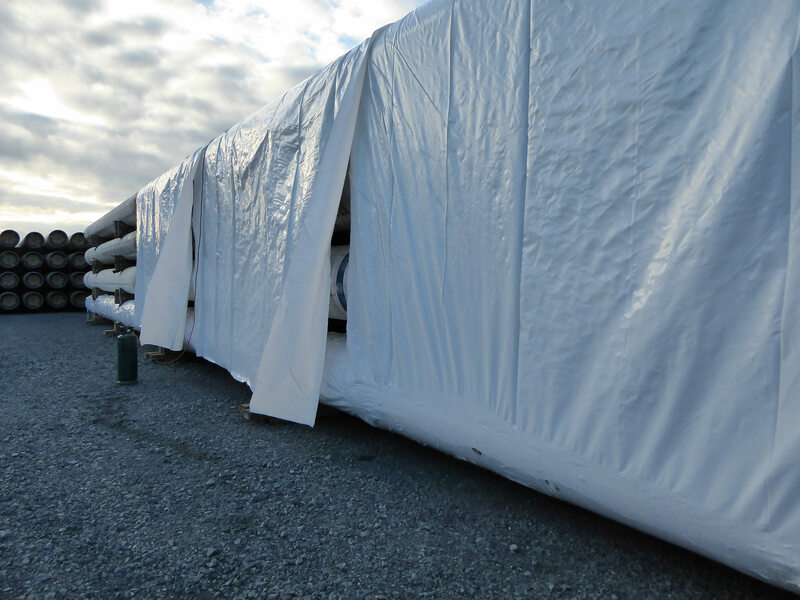 it just needs shrink wrap sheeting and no additional tie downs or weights are required which had typically been used to hold down the more traditional tarpaulins during testing. However, the ends of each stack of pipes presented more of a challenge. The customer wanted to leave the ends of the stacks open which meant that we had to find some way of terminating the shrink wrap cover across the 15m (49′) width of the stack at a height of 4m (13′). To achieve this we installed and tensioned woven strapping. When the shrink wrap sheeting was installed, it was wrapped around this strapping and heat welded to itself to provide an anchoring point. What size and grade of shrink wrap sheeting will work best for industrial covers? We stock rolls of shrink wrap sheeting in a variety of widths from 6m to 16m wide and from 190 microns to 500 microns thickness. However, it is not just a matter of choosing the largest roll size possible. 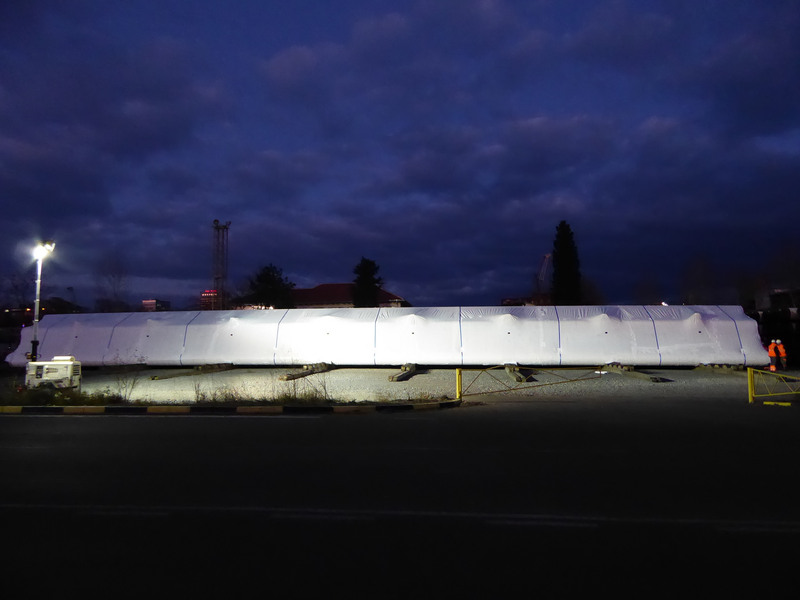 For this project we decided to use a 6m (20′) wide x 25m (82′) long roll of our 300 micron (12 mil) shrink wrap sheeting. This roll weighs 43Kg (95lbs), but whilst it is not exactly ‘lightweight’ is is more manageable than a 16m (52′) x 50m (164′) roll which weighs 163Kg (359lbs). A narrower shrink wrap roll width will often tend to have a much better ‘shrink ratio’ and that was important to us on this project because we wanted the covers to shrink down as tightly as possible around the line pipe stack. A tight covering of any kind will be much less likely to move, rub and flap and consequently will be much less likely to come off in strong winds. The 300 micron (12 mil) grade is probably thicker than many might select for industrial covers but because the covers could be in use for up to 2 years we felt that this would provide better protection than say a 190 micron (8 mil) shrink wrap which is often used for shrink wrapping boats and smaller industrial products during transport and storage. Because the customer wished to leave the ends of the line pipe stacks open, we felt there was a risk, during high winds, of the shrink wrap covering being damaged by being pushed up from the inside. As a ‘belt and braces’ approach we decided to fix straps over the shrink wrap covering which could be ratcheted tight and absorb the additional wind loads resulting from having each end of the cover open to the elements. What will be the installation process? A detailed installation process is outlined in ‘The Shrink Wrap Installation Process’ below. However, with every installation project that we are involved in, it is vital that we can develop and document a safe system of work. With the exception of harnesses, we exclusively use safety equipment manufactured by Spanset in the United Kingdom. For this project in particular we used the Spanset Lightweight Fall Arrestor and the Spanset Recovery Block. The Recovery Block with a 15m line was secured to an overhead crane and used for the installation of the strapping. Once these straps were installed, our installers switched to the Lightweight fall arrestor which has a 3m line under constant tension. The time scale for this project was tight. We needed to get the first stack covered before the Christmas break. As shrink wrapping is always weather dependant on relatively calm winds and dry conditions we were hoping that the weather would be kind to us! We had shipped a pallet / skid of materials in advance which meant that our 2 man team could fly out as soon as the materials landed and the customer gave us the go ahead. For this project, Kris Martin and Tom Mount from Rhino were selected to carry out the work. Both Kris and Tom have many years experience shrink wrapping scaffolds and general industrial products. After their four hour flight, they picked up their rental car and headed directly to the customer’s site to complete the induction, security checks and get site passes issued in order to get a rapid start to work the following morning. First, the customer wanted to verify that the coating of the line pipe would not be damaged by the heat shrink process so we were requested to undertake a test on a scrap piece of pipe before the full scale covering. The customer first placed temperature indicating strips around the pipe, in locations where the shrink wrap cover would be shrunk and also in locations where the shrink wrap sheeting would be welded together. 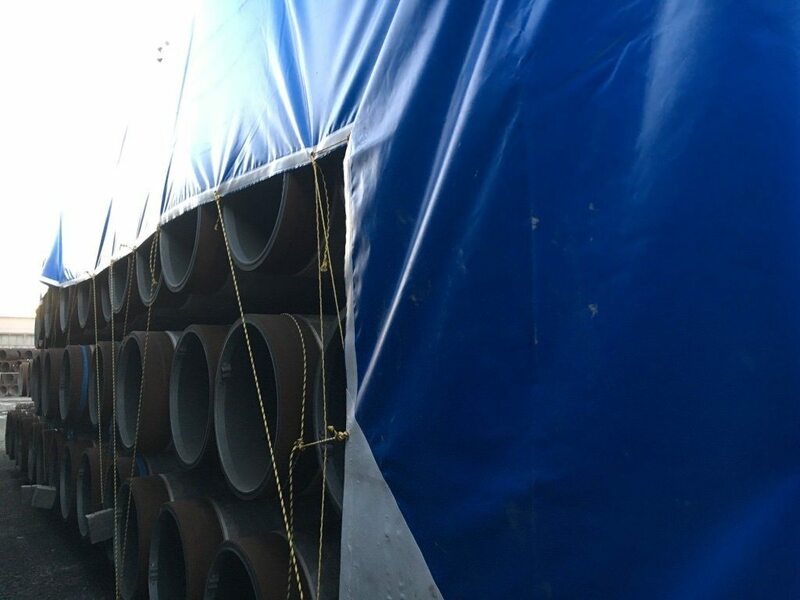 Once the sheeting was installed, the covering was cut open to reveal that virtually no heat had been transferred through to the coating of the pipe during the shrink wrap process and we were given the all clear to continue with the work. To begin, the bottom line pipe is encapsulated using a 3m wide strip of Rhino 300 micron shrink wrap film, along the entire 48m length of the bottom pipe on each side of the stack of line pipes. Next, woven strapping (3.5 ton break strength) is installed to provide a termination point / ‘perimeter band’ for the top cover at each ‘open pipe end’ of the stack. 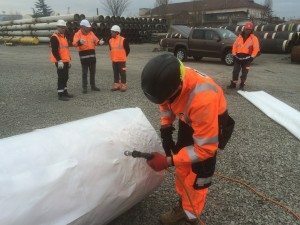 The first 6m wide sheet is overlapped to the bottom shrink wrapped line pipe by 30-40cm and the two sections of shrink wrap cover heat welded together at ground level. The first 6m wide sheet is also welded around the tensioned strapping / ‘perimeter band’ installed at the open end of the stack. Strapping is installed at 4m intervals up & over the first 7m wide strip and ratcheted tight. The benefit of this approach is that the work can progress in controlled stages. Even if it became windy before all the strips of shrink wrap sheeting had been installed and heat shrunk, the strapping keeps everything under control. The strapping is terminated / secured at either end by passing around a line pipe. (To secure strapping around line pipe it is necessary to make a small hole in the cover – this hole can then be taped or a patch of shrink wrap cover heat welded over the top). The next 10 runs of strapping are fixed into position. Kris and Tom switch from the 15m long fall arrest blocks to a 3m long lanyard which will attach to the 3.5 ton tensioned straps. Because the strapping is installed at 4m intervals, this means that it is not possible for an operative working on the top surface of the line pipe stack to reach the edge. Work to fix the cover in areas which are within 2m of the edge of the line pipe stack takes place from within a scissor lift. The 2nd and 3rd shrink wrap rolls rolls are unfolded by the two man team across the top of the line pipe stack and pass under the tensioned strapping previously installed. The 2nd strip of shrink wrap film is overlapped onto the 1st 6m wide strip by 30-40cm and heat welded to bond the sheets together. It is also welded the shrink wrapped bottom pipe. The 3rd strip of shrink wrap is overlapped onto the 2nd strip by 30-40cm and heat welded to bond the sheets together. It is also welded the shrink wrapped bottom pipe.. The 1st 6m wide sheet is now heat shrunk ‘drum tight’ both up the sides and over the roof of the stack. The process is repeated in 6m wide strips until the entire stack has been covered and heat shrunk tight. The final stage of the process was to install some self adhesive weather proof air vents. These vents allow a cross flow of air beneath the covering and also allow wind that enters the open ends of the stacks to be vented without damaging the cover. For this project we installed one air vent every 25 square metres, both over the top and along the sides of the line pipe stacks. 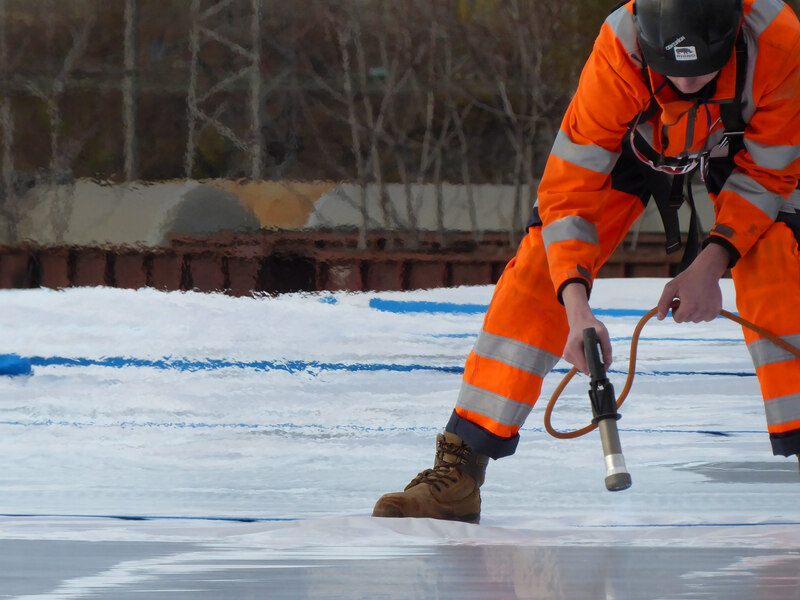 Weather – On these large shrink wrap projects that require the work to be carried outside, the weather can be problematic. Light winds are require to shrink the sheeting ‘drum tight’ and where sheets of shrink wrap needed to be heat welded together, this can be difficult if sheets are wet. 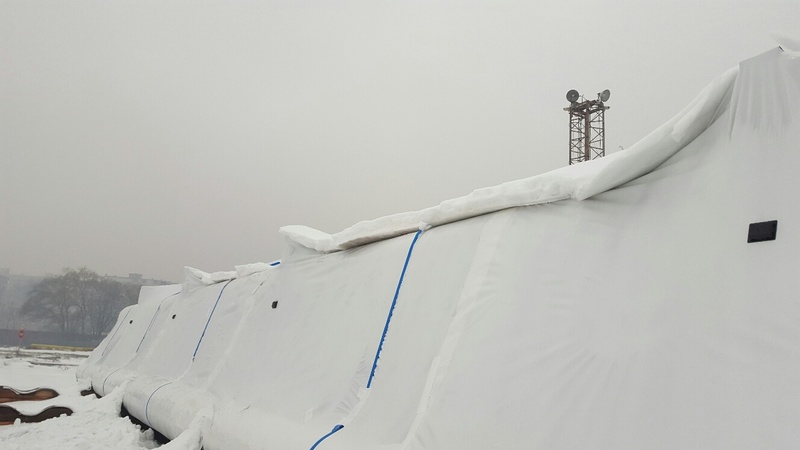 On this project, it snowed shortly after completion and this put extra pressure on the shrink wrap sheeting where it passed around the top corners of the line pipe stack, causing some splits to appear. It was subsequently decided that we would install a reinforcing patch on the shrink wrap cover in these vulnerable areas and that we would also improve the method of attaching the strapping / perimeter band at the open ends of the stacks. We manufactured a small but robust clamp which we fixed to the bottom row of open line pipe ends (and down each 4m high edge of the stack) at 2 metre intervals. When we passed the strapping through these clamp points it proved to be a much improved method for anchoring the shrink wrap sheeting at the ‘tricky’ pipe ends. 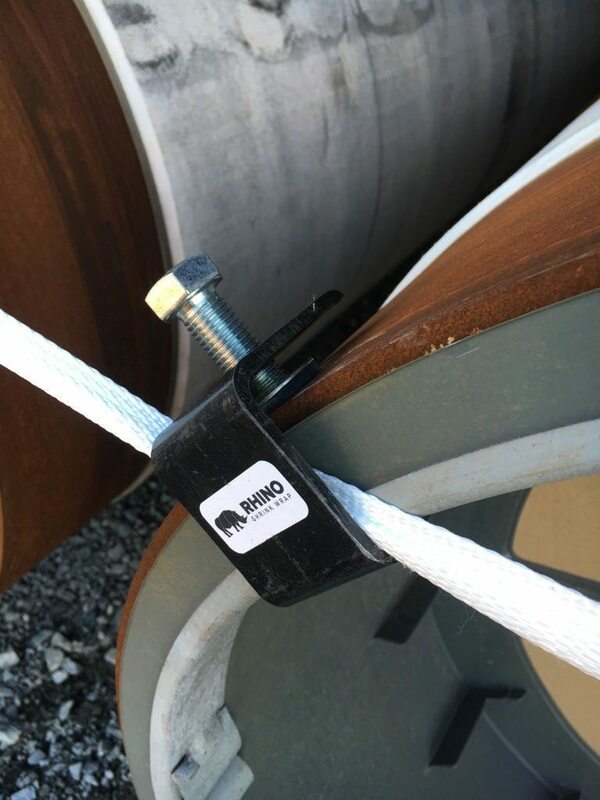 At Rhino we don’t automatically assume that a shrink wrap cover is right for everybody or every application. However, if you have found this case study useful and you would like to find out more please call or email us today and one of our friendly and knowledgable team will be happy to help.